It hasn’t been an easy or straightforward path to get the 2015 EuroBasket tournament but now that the draw has been made, splitting the top 24 teams into 4 groups, there is a greater sense of positivity and confidence about the tournament. 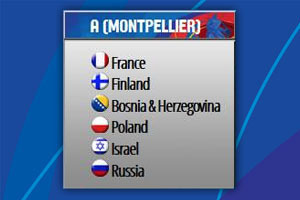 The groups will be located in Montpellier in France, Berlin in Germany, Zagreb in Croatia and Riga in Latvia. Holders and host of the final round France are in Group A, and they will clearly be keen to make their home advantage count. They will be joined by Israel, Poland, Finland, Bosnia & Herzegovina and Russia. In Group B, Iceland make their Euroleague debut and they will face a number of tough tests from the likes of Germany, Serbia, Turkey, Italy and Spain. In Group C, one of the biggest stories is the fact that the Netherlands are returning to the tournament after a 25 year absence. They will face Georgia, Slovenia, Greece, Croati and F.Y.R. of Macedonia. 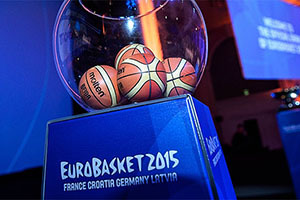 Group D is held in Latvia and they will welcome Ukraine, Belgium, Czech Republic, Estonia and Lithuania. At last summer’s FIBA World Cup six of the eight quarter-finalists and three of the four semi-finalists came from our continent, just like at the 2010 FIBA World Championship. These results show that Europe remains the heart and soul of international basketball and will continue to be so when we celebrate the 80th anniversary of EuroBasket next year. I am confident that in Croatia, France, Germany and Latvia, we have four very able host nations that will provide a spectacle which will have the eyes of the basketball world solely focused on Europe. The very first pan-European Basketball Championship will collect many thousands of basketball fans from the whole continent to celebrate the biggest, most colourful and happiest basketball event that ever took place in Europe. Clearly no one is going to be questioning the event at this early stage and while there will be some loss to the event, there will be other benefits as well. The fact that the Ukraine was left unable to host the event was a major shame, but there are clearly more important things for the Ukrainian people to concern themselves with, and there should be confidence in the 2015 FIBA EuroBasket event being a success.